This is not a long walk, taking not much more than half a day, and it is technically very straight forward. It is, however, an absolute delight, and is best left for a warm day when limbs are weary from previous efforts and the opportunity to have a stress-free stroll through some wonderful terrain will be a welcome relief. The route goes up to the Col de la Petite Vache from the col de la Charmette, traverses the internal valley to the south, and returns via the Col d'Hurtière (map). If you would like to make it a slightly longer day, you could combine it easily with an ascent of la Grande Sure. This will probably add 1½ hours to the day. The walk starts from the Chalet Col de la Charmette where there is a PNRC parking area (1270 m, grid ref. UTM 31T 71465 50227). The path starts by climbing up behind the chalet on a modern forestry track, and for the first 20 minutes is steep and stony. There are a couple of junctions, and you should keep right at both. Once past the second junction, the path becomes a lot more pleasant and the gradient eases. At the same time, the terrain becomes more open, and one finds oneself wandering through a wonderland of flowery glades, lapiaz, and small cliffs. Fifty minutes after leaving the chalet, the col de la Petite Vache is reached. 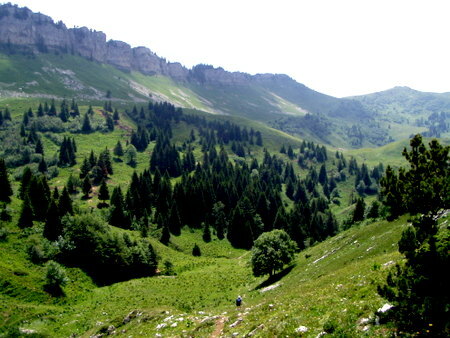 In front, the path drops down into the internal valley, whilst opposite the flanks of the la Grande Sure rise up steeply, with the summit off to the left. This is a good place for breakfast. We now head for the Col de la Sure, which is some 25 minutes off to the left. A few metres beyond the col we turn left at a division of the ways. The path then traverses the flanks of the valley, past a further junction with a path going off down towards la Velouse at a big boulder. Behind, the southern cliffs of la Grande Sure can be seen to good effect. Soon after, another path descends down to the refuge below, and our path begins to rise up towards the col d'Hurtière. A fence is crossed some 50 minutes after leaving the col de la Grande Sure and the views suddenly open up towards Charmant Som and Chamechaude to the east, and towards the white cliffs of the Rochers de Chalves to the south. The best way on is to follow the path up to the right alongside the fence. This leads to the col d'Hurtière proper (1740 m), and the path then gently descends into the continuation of the valley to a signposted junction under the Rochers de Chalves. This is is the Prairie de Pararey (1655 m). Our way turns left here descending the valley through the pasture to enter the forest some 15 minutes later. The next hour is an easy but exquisite walk along an undulating path through the forest-covered lapiaz, which returns you directly to the car park and a well earned beer at the bar.